Be the first to share your favorite memory, photo or story of Loren . This memorial page is dedicated for family, friends and future generations to celebrate the life of their loved one. 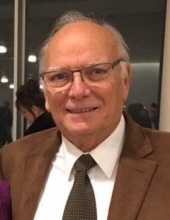 Loren Wayne Leach, 73, of Iowa City, IA, passed away Thursday, March 28, 2019 at his home surrounded by family. A Memorial Service will be held at 11 AM, Wednesday, April 3, 2019 at Lensing Funeral & Cremation Service, Iowa City with Pastor Kurt Larson officiating. Visitation will be held an hour before. Burial will be at Oakland Cemetery, Iowa City. In lieu of flowers, memorials may be made to Iowa City Hospice, Harvest Preserve or The University of Iowa Foundation: Holden Comprehensive Cancer Center. Loren was born on December 3, 1945 in Belfast, Northern Ireland the son of Howard and Elizabeth (Barr) Leach. He graduated from The University of Minnesota with a degree in Civil Engineering in 1968. Loren was united in marriage to Joanne Ogdahl on December 27, 1968 in Minneapolis, MN. He worked for Metcalf and Eddy, Shive Hattery, Boyle, Shoemaker Haaland, City of Mt. Vernon, and Loren W. Leach P.E.. After retirement Loren worked for The City of Iowa City, Veenstra and Kim, mowed at Harvest Preserve and delivered tractors for City Tractor. Loren enjoyed keeping active and his hands moving. He was able to figure out any problem and was a do-it yourself type guy. Loren enjoyed gardening; sharing his produce with the local foodbank, woodworking and spending time with his granddaughter. Loren is survived by his wife of 50 years, Joanne Ogdahl, of Iowa City; two children, Todd (Kerri) Leach of West Branch, IA and Terie (Jeremy) Snyder of Iowa City and their daughter, Lauren. Loren was preceded in death by his parents, Howard and Elizabeth Leach. To send flowers or a remembrance gift to the family of Loren W. Leach, please visit our Tribute Store. "Email Address" would like to share the life celebration of Loren W. Leach. Click on the "link" to go to share a favorite memory or leave a condolence message for the family.